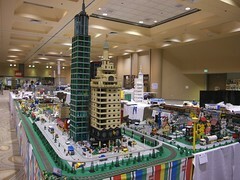 Our annual LEGO convention here in the bay area, Bricks by the Bay, just happened! I was so busy organizing it that I’m afraid I never got around to posting a blurb on my blog about it – hope you heard about it through other means and were there! It was a huge event, expanding to add a second ballroom, and adding an extra day (Thursday) for a new workshop program. We almost doubled last year’s attendance on the public day (about 4500 vs 2500 last year) though our convention attendance was down. I’d like to announce the dates for next year’s convention, but we don’t have a firm commitment on the dates yet. The most likely dates are July 16-19, but we can’t be sure until we have a contract from the hotel. The theme for next year will be “Monsters” and we will be also making a special effort to highlight models with lighting effects similar to what they do at Brickworld in Chicago and BrickFair back east, shutting off the convention center lights for a few hours in the evening to let people enjoy the lit-up MOCs (My Own Creations). So start planning your monsters, especially ones with light-up effects! If you have some to add, post a link in the comments. 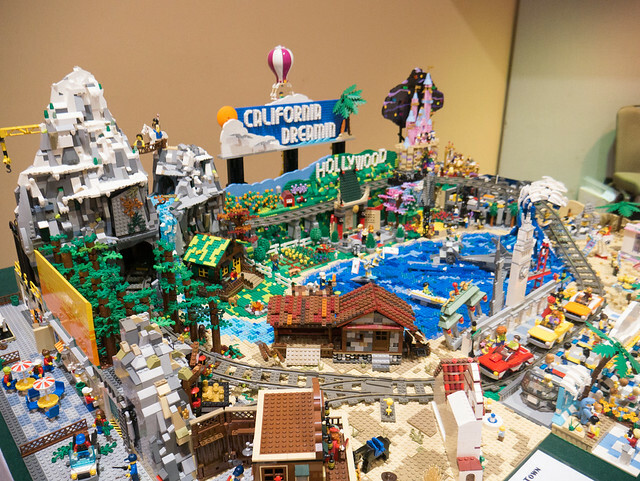 We just posted an announcement on the BBTB blog that Bricks by the Bay 2013 is 75% sold out. Have you signed up yet?